Fly fishing trips are welcomed (personal guides can be arranged advance). 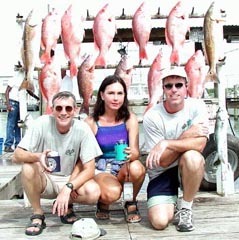 Fishing the inshore waterways, reefs and marshlands near Venice for trout, Redfish, Drum, Flounder and Sheephead. You can expect to catch a mixed variety in all size ranges depending on the season and conditions. Ice, Bait, Tackle and Fuel included. We offer full use of either a 25 foot MAKO or 20 MAKO Center Console. Wade fish in and around the world famous Breton and Chandeleur Island Chain for Mule Trout and Bull Redfish. Catch fish, swim in the waves, picnic, watch the birds or comb the miles of beach and bars for shells. Be sure to bring the wade fishing essentials (bathing suit, net, stringer, hard bottom shoes, towel and dry clothes). If you are into fly fishing, be sure to pack your gear: this is as good as fly fishing gets in Louisiana! We can accomodate parties of 12 by booking both boats. We furnish the guide(s), ice, bait, tackle and fuel. Drop to bottom along numerous oil platforms and wrecks for Snapper, Cobia, Grouper, Amberjacks, Triggerfish, Kings and Sharks. You will need a spare ice chest to bring home your catch. Rest your arms the night before. We provide ice, fuel, bait and tackle. Troll by the offshore drilling platforms and bluewater rips for Billfish, Dolphin, Wahoo and Tuna. 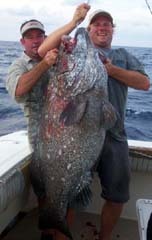 Spend the day and go where few have been to do battle with the largest and tastiest fish in the Gulf of Mexico. Excitement guaranteed! We can accomodate up to six passengers if you wish. Coast Guard Regulations only allow for a maximum of six passengers per boat. Parties larger than six can be accommodated by booking more than one of our boats. All trips leave the Venice Marina at safe light unless otherwise arranged in advance. Weather cancellation at the discretion of the Captain. 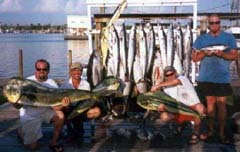 Inshore trips generally last eight hours with offshore and island trips lasting all day. Oct 03, 2003 Sandy Great time!